That's hard to remember in the face of disillusionment or heartache. Ted Kluck's world was turned upside down after experiencing a failed adoption, where he found himself propelled into a year of doubt and disillusionment. Ronnie Martin struggled with the kind of identity and idolatry issues that come with being a well-known recording artist, before the unexpected death of his father allowed those sins to be brought to the surface of his heart. it is in the midst of these and other everyday stories that we learn how God reveals His boundless grace to every one of us. Whether you've lost someone you loved, suffered career failure, or simply been let down by a fellow Christian, it's natural to wonder whether God has forgotten about you. You're not alone. Kluck and Martin's raw revelations about their mistakes and disappointments will help you on your own journey to finding God when you're standing in the dark. I'd bet my last dollar that you have been in circumstances so dark that you wonder where God is, and how He could allow you to be where you are. I'll admit it, I've spent much of the last two and half years in the dark, wondering if God has forgotten about us. Life is quiet, our hearts have been dry, the burden of our circumstances have been heavy. While I knew in my head that He will never leave us, my heart felt otherwise. 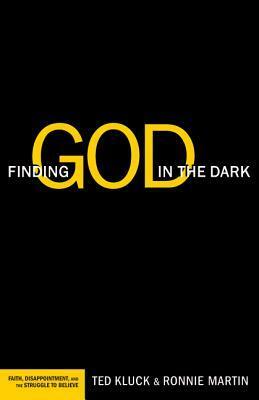 So, considering how long this season of darkness has gone on, I was curious to read this book, as the title intrigued me. I wasn't overwhelmed by this book. At only 139 pages, it's a very quick and easy read, almost blog-like in the writing. Each author has his own writing style, yet the book didn't mesh together. It's two authors in the same book, not relating to the other. While I appreciated the authentic sharing of the author's hearts, I didn't feel inspired or as though I learned anything new about navigating the darkness of this season we are in. It was a good reminder that we all struggle with disappointments and tragedy. I just felt as though the book didn't go deep enough for me to connect with it. I'm not disappointed in it, it just came across as very light, blog reading. Posted by Kate at 11:37 p.m.